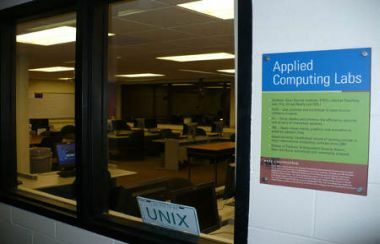 The Applied Computer Science Labs at Clarkson University consist of the Clarkson Open Source Institute and the Internet Teaching Lab. These labs, which are part of the Computer Science department, are almost entirely student-run, offering the opportunity to gain experience in managing both facilities and projects. Both labs are located on the 3rd floor of the Science Center in rooms SC334 and SC336 and were renovated due to the generosity of the Rechler Family Foundation, the George I. Alden Trust, and a SUR grant from IBM which resulted in a complete renovation in the Summer of 2006. The ITL (SC 334) is one of the few Internet Teaching Lab's in New York State. Classes are taught here and events such as the ACM preliminary programming contest are held here. The VR Lab focuses on research in Computer Games, Virtual Enviornments, and Computer Graphics. If you are interested in joining the labs, learning more, and/or working in the labs for course credit, feel free to stop by any time the lab is open to look around and talk with current students and faculty. You can also find more information about each lab in particular on the "The Labs" pages on this website or from each lab's individual website. You may also contact the lab advisors which are located on the "Contact" page of this website.